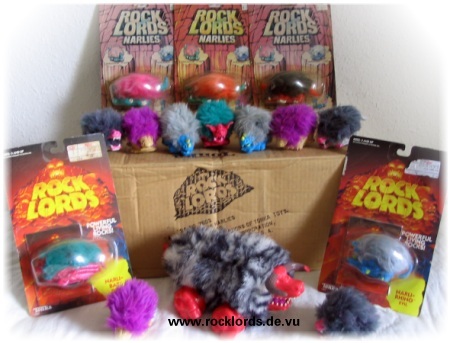 The Narlies are small furry creatures that live on the Rock Lords Planet, Quartex. Naturally, some are good and some are evil. Snarlie Narlie is the king of the evil Narlies. The toy even had motorized action, while the other narlies have to be moved by hand. When they are pushed around, the narlies shake their tail and their jaw snaps, their fur "moves" making them look "alive" (see TV Commercial). 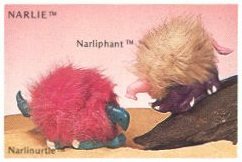 Additionally, each Narlie produces a sound when it is moved, each having its individual sound. 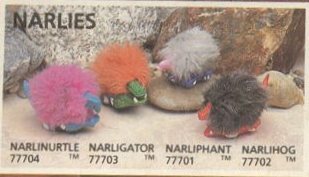 The Narlies were never released in Japan, and second series Narlies (Narlibaboon, Narlirhino, Narlilion, Narlibat and Snarlie Narlie) were not released in Europe (but in the UK - however it is not clear if the Snarlie Narlie made it to the UK). The Full Narlies line was released in the USA, but the second series is very hard to find.
" 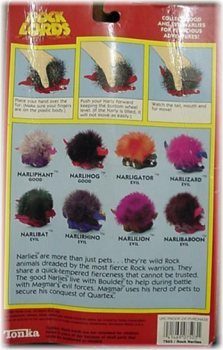 Narlies are more than just pets ...they're wild Rock animals dreaded by the most fierce Rock warriors. They share a quick-tempered fierceness that cannot be trusted. The good narlies live with Boulder to help during battle with Magmar's evil forces. Magmar uses his herd of pets to secure his conquest of Quartex." 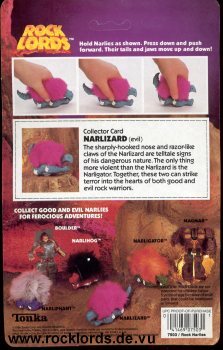 In Europe, Narlies were sold on special Bandai cards, that differ from the Tonka US cards. 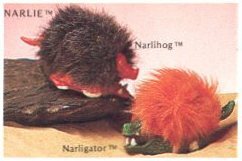 The Narlizard was called Narlinurtle. Narlies were never sold in Japan.